"Now the Lord is the Spirit; and where the Spirit of the Lord is there is liberty. But we all, with unveiled face, beholding as in a mirror the glory of the Lord, are being transformed into the same image from glory to glory, just as by the Spirit of the Lord." 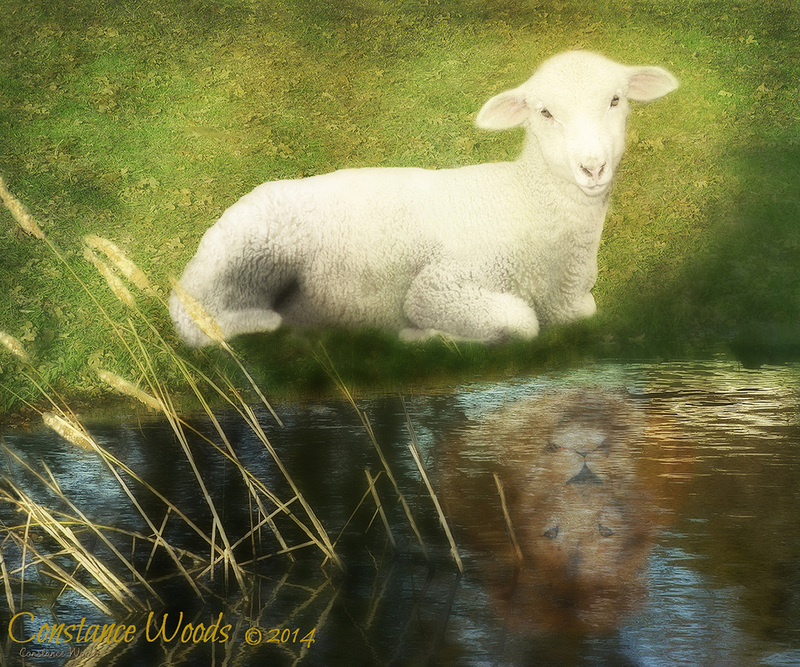 We tend to see ourselves as the Lord's sheep. True, that is an aspect of our identity. But, God has called us to so much more. When we look into the Living Water of His Word we see ourselves with the authority of our Lord as Lion of the Tribe of Judah. We are transformed into His likeness and we walk in this greater authority. Many of my creations are compiled of different images. When this was in progress, I thought that it was finished when the surprise idea came from Yeshua to add the reflection of the lion.